Instant Pot Paleo Beef Stew is super easy to make and so delicious. 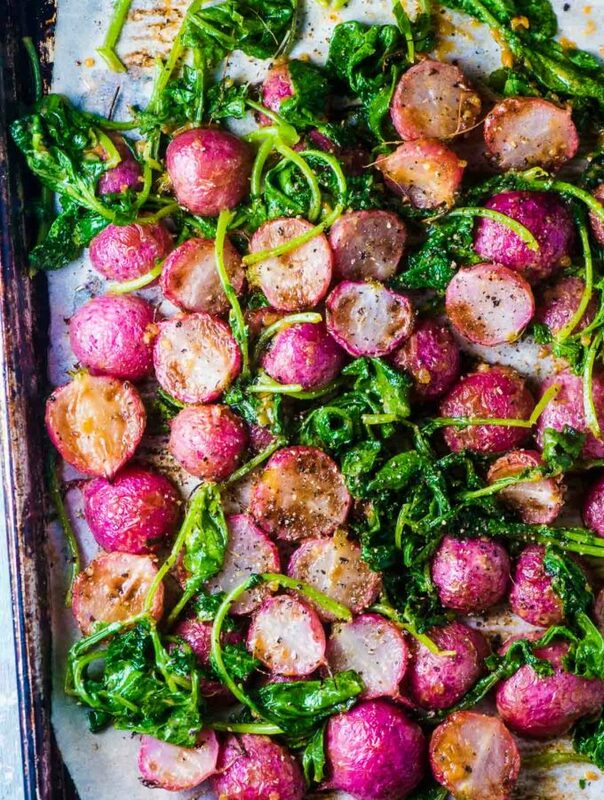 It's a crowd-pleasing Whole30 recipe guaranteed to become your family's favorite. I've spent all month testing out pressure cooker recipes with the Instant Pot my mom lent me. (Thanks, mom!) I was pretty sure they were gimmicky and I'd never be able to justify the space they take up in my tiny condo kitchen. Kitchen real estate is at a premium in my place so I don't keep any extras unless they're worth their weight in gold to me. But being able to cook beef stew in 35 minutes has earned this guy a place in my home. 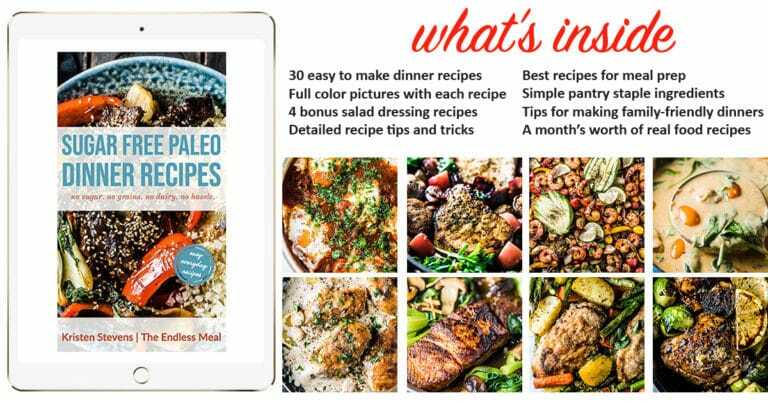 Expect to see more Instant Pot recipes popping up here. I've got to say it again, being able to turn tough stewing meat into tender delicious morsels in 35 minutes is just awesome. It's warm and comforting with all your favorite stew veggies. Pesto. Yes, you read that right. 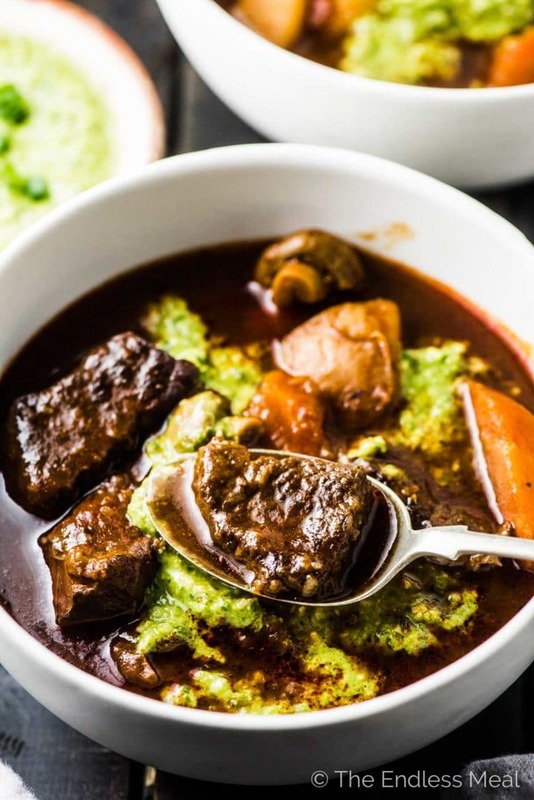 That green in the bowl of stew is pesto. It sounds strange but it brightens up the flavor and gives the stew a little something special. And I'm a sucker for a pretty pop of color. The first thing you need to know about how to cook beef stew in a pressure cooker is that it is SUPER EASY! Like, crazy easy. Option #1: Throw all the ingredients into your Instant Pot, close the lid, and set the timer for 35 minutes. Option #2: Spend 15 minutes browning the beef in your Instant Pot before adding all the other ingredients. I always opt for the second option as I like having the nice dark sear on the pieces of meat. And you can use that 15 minutes to chop the veggies, open the can of tomato paste, and get the spices ready. Making a paleo beef stew recipe is not all that much different than making a regular beef stew, but there are a few changes you need to make. Traditional beef stew is made by tossing the chunks of beef in flour before you sear them. This helps them to dry out a little, but it also helps to thicken the stew. 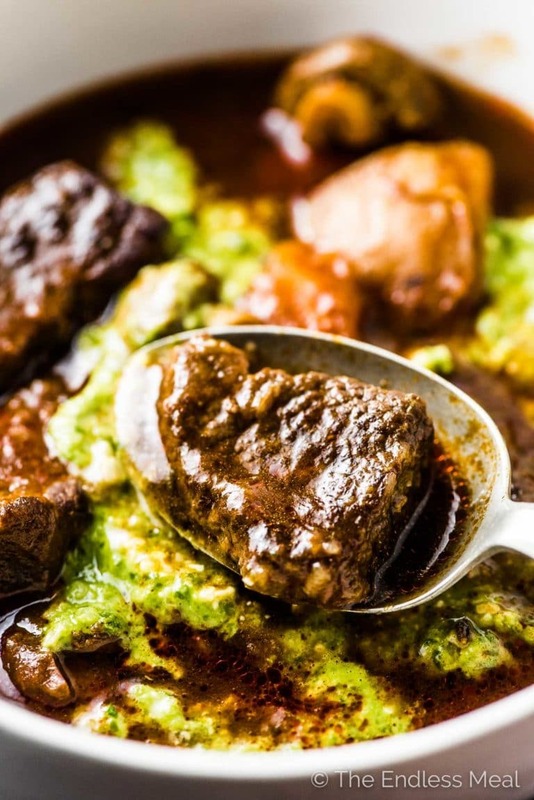 Instead of flour, this paleo beef stew recipe uses agar powder (made from seaweed) to thicken it. 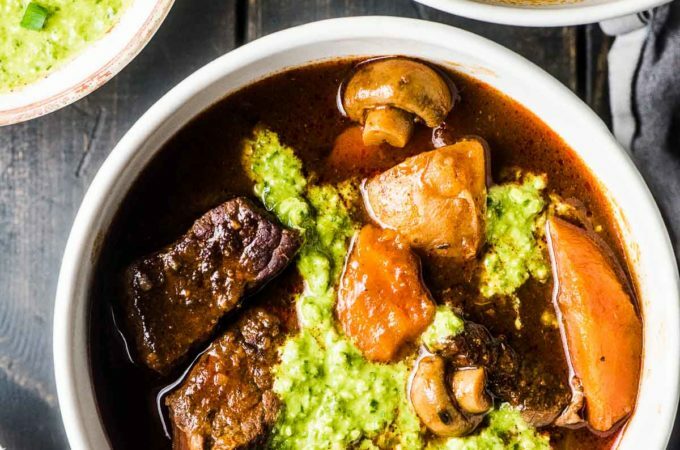 Beef stock is the liquid you want to use. 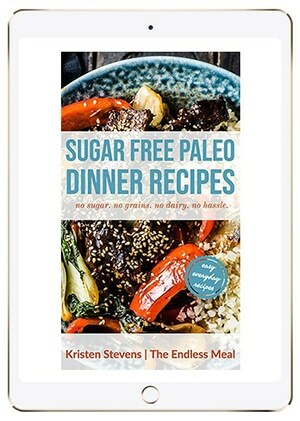 If you eat a paleo diet, make sure to read the label as stock can often have a lot of additives in it. A good option is Kettle & Fire's Grass-Fed Beef Bone Broth. Or go homemade! 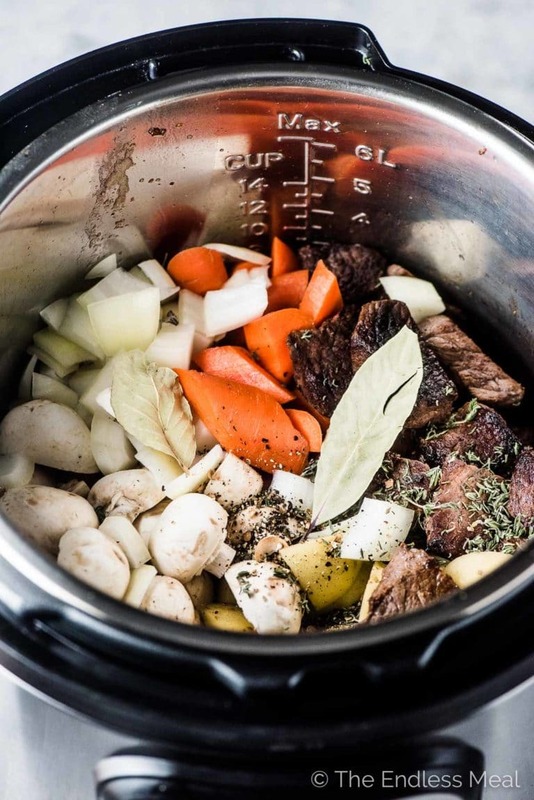 If you make those two small changes this Instant Pot beef stew recipe becomes a paleo beef stew recipe. And I promise that no one will know the difference! 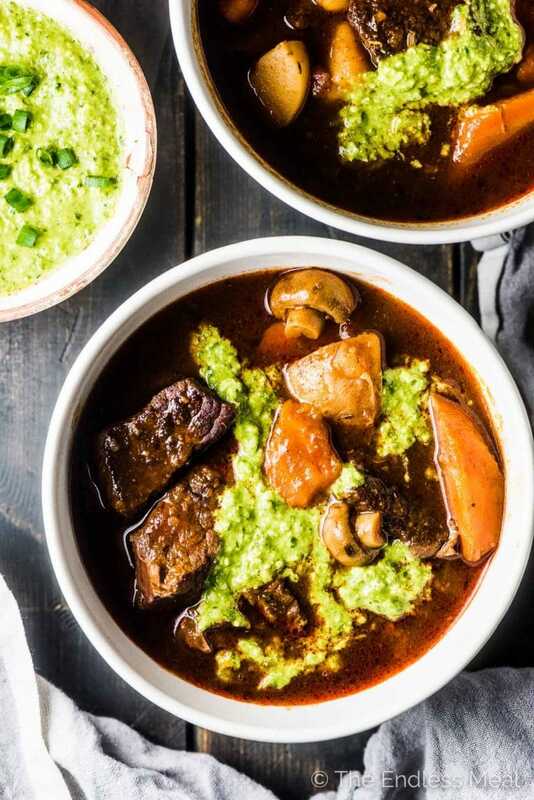 If you love recipes like this Instant Pot Beef Stew, make sure to check out my cookbook Sugar Free Paleo Dinner Recipes! Add the tomato paste to the pot and let it caramelize for 3-4 minutes, or until it has darkened and is sweet smelling. Add the browned meat, carrots, onion, mushrooms, baby potatoes, beef stock, thyme, and bay leaves to the pot and stir. Lock the lid and set the Instant Pot for 35 minutes on High Pressure. When it has finished cooking, use the quick release to release the pressure for at least 5 minutes. Sprinkle the agar powder over the stew and stir to thicken. While the stew is cooking, prepare the pesto. Place all the pesto ingredients into a blender and blend on high until mostly smooth. If needed, you can add a little water to thin the pesto. Serve spooned over the top of the beef stew. Agar powder is a powder made from seaweed that does an excellent job of thickening liquid. You can find it at most health food grocery stores (like Whole Foods or Trader Joes) or you can buy it online here. If you like Whole30 recipes like this Whole30 Beef Stew, check out my cookbook Sugar Free Paleo Dinner Recipes! I was so happy to see this!! I got an instant pot for Christmas & need some recipes to try. Can’t wait to see more! One way I like to thicken stew is – once cooked – I ladle out 2 cups of broth and veggies and blend them with an immersion blender. Makes a thick gravy which I add back to the stew. 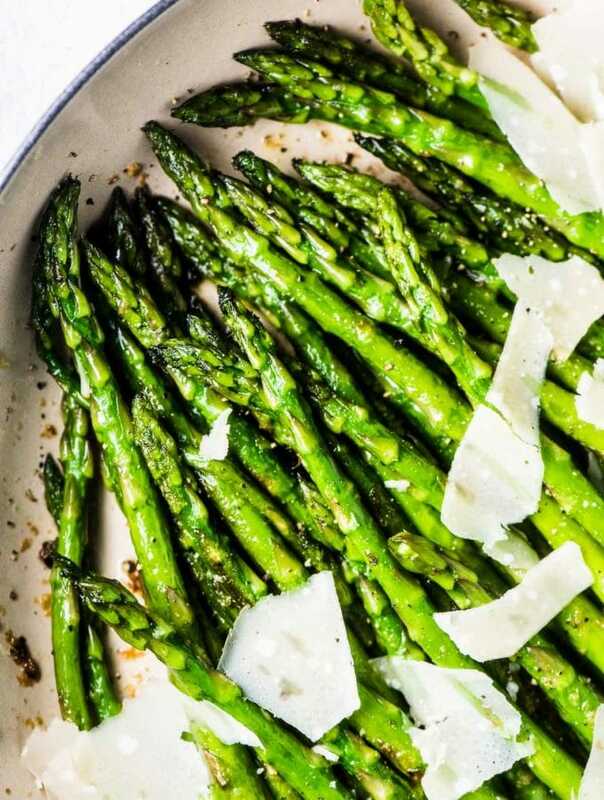 This looks seriously yum, but, not all of us are fortunate enough to have an Instant Pot. ☹️ how long would it take to cook conventionally, or in a slow cooker? I’ve made a similar beef stew on the stovetop and simmered it for at least 2 hours – although more is better. In a slow cooker, you’ll want to cook it on high for 4 hours or low for 8-10 hours. The slow cooker is a great option if you want to come home to stew after work!